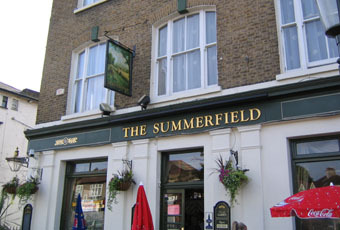 Really like The Summerfield. Friendly staff/Landlord, good mix of crowd from young to old. As an alehead there is not a massive selection in that respect, but the Doom Bar/Bombardier is always well kept. Overall a very good local to have for either a quiet afternoon weekend beer, or meeting up with friends for after work drinks and a game of pool. Going to this pub is like hearing the beatles for the first time. Good beer, good staff, and always good times. A great old fashoned street corner local. Loads of forthcoming attractions advertised at the bar. Rooms to stay upstairs, a decent pint of Youngs and a stunning and efficient bar maid. If you havn't visited can thouroughly recommend the Summerfield. Do they still hold the Tuesday night quizes? Great pub with something for all, mixture of customers from young to old. Found there was always something going on over weekend. Run by a govnor that cares. If you haven't been take the time you won't be disappointed!! !